Habit: Perennial herb 6--16 cm, from woody taproot and thick, short-branched caudex, cespitose. Stem: 1--4-branched proximal to mid-stem; hairs spreading or reflexed, soft-bristly and minutely stalked-glandular. Leaf: basal erect, crowded, 2--6 cm, +- linear to oblanceolate, proximal generally long-spreading-ciliate, generally long-rough- or soft-hairy, occasionally +- strigose or +- glabrous; cauline 0 or gradually reduced distally on stem. Inflorescence: heads 1--5(50); involucre 4--7 mm, 7--12 mm diam; phyllaries +- equal, +- stiff-spreading-hairy, +- minutely glandular. Ray Flower: 40--60; ray 7--9 mm, white to pink or lavender, reflexed or weakly coiled when dry. Disk Flower: corolla +- widely funnel-shaped, sharply scabrous. Fruit: pappus bristles 5--15, outer series of prominent, wide scales 0.2--0.5 mm. Chromosomes: 2n=18. Ecology: Sandy to rocky slopes, crevices; Elevation: 1200--1800 m. Bioregional Distribution: DMtns; Distribution Outside California: to Idaho, Wyoming, Colorado, New Mexico. Flowering Time: Apr--Jun Note: 2 other varieties in southwestern United States. 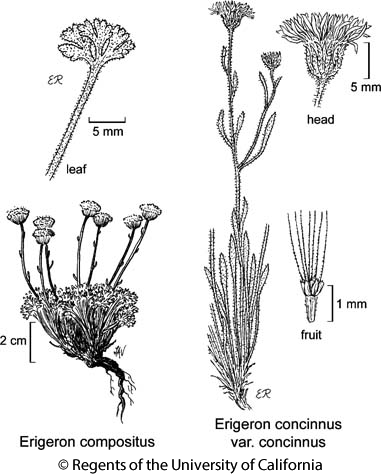 Citation for this treatment: David J. Keil & Guy L. Nesom 2012, Erigeron concinnus var. concinnus, in Jepson Flora Project (eds.) Jepson eFlora, http://ucjeps.berkeley.edu/eflora/eflora_display.php?tid=7264, accessed on April 24, 2019.